Stained glass panels depicting animals are often flat and lifeless. Most must be done life-size or larger to capture the spirit of the animal. So, how do we cure that problem of "flatness"? Why do we need to do the panels life-sized? Well, it's all in the eyes. If you can capture the eyes, you have captured the spirit of the animal. 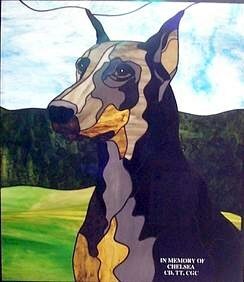 We were asked to do a memorial panel for a beloved Doberman champion. 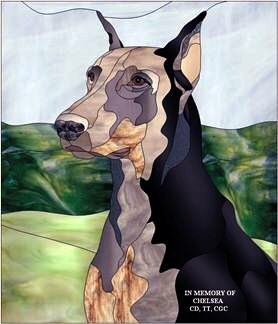 This was an older dog, and rather than all blacks and browns there was much gray. She was a beautiful dog and we wanted to do our best to capture the dog's intelligence showing in the photo we were given. First we drew the pattern, being careful to follow the musculature lines of the dog, and sent this to the kennel owner. She was delighted and said "It looks just like her!" In using Glass Eye 2000 to draw for clients, one is given the liberty of playing with colors as well as superimposing text to show a close rendition of what can be done in glass. The freedom to rotate the glass image is wonderful for presentation purposes and clients are always amazed at how quickly the design can be accomplished and exported to them by email. As we got into designing the panel, we found the solid color background just didn't work (see above), but using the same lines as the original printed pattern we changed it to an outdoor scene (see below). It was easy to change the glass color using Glass Eye 2000 and it gave the panel much more depth. 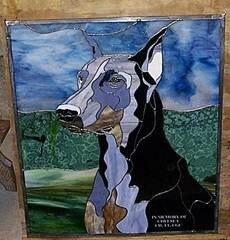 It's always a bit of a problem portraying black dogs in glass. It's that black-on-black thing. So break it up with some black textures to show the varying muscle lines in the animal. Browns are plentiful but you must hand-pull the glass sheet to get exactly the right mix of browns and streaky/wispy browns to give the best effects of fur. Below is a photo of the finished panel on the work board with only reflected light. Always check how the glass will look with and without light passing through it. Some glass will completely change color in bright light. Below is the finished piece with refracted light. We drove six hours to deliver this panel. Why? We were also picking up our Doberman puppy, Isaiah! The memorial lettering is etched onto flashed glass as are the glints in the eyes. Showing this light reflection in the eyes brings a creature to life. While the glint pieces may be tiny, it is always worth the time to include them. The change from lifeless to lifelike is phenomenal. The client was very pleased with the results and immediately hung the piece in the window and put a photo of the panel up on Facebook. 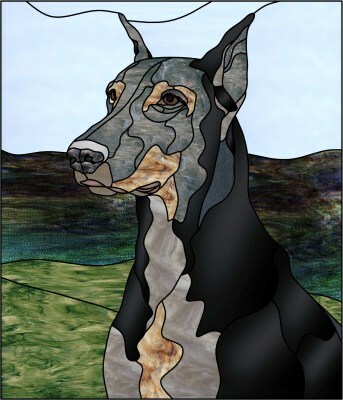 She liked it so much we're now doing another panel of a fawn Doberman of hers. Now to find just the right glass! This pattern is included in our newest pattern collection: All Critters Great & Small.